Our LA part of the summer vacation is now over and the family is finally heading to Hawaii this morning. And although it would be nice to get lei'd and laid, I think that with 3 small kids in tow the possibility of gettin' sumthin'- sumthin' with the husband will be close to impossible. So let me ditch the latter for now. I can't wait to sip my virgin mai tais, stop my toddler from eating sand, and apply sun-block to my sweaty boys all day. Oh the joys! But don't pity me -- at least I'm getting lei'd. 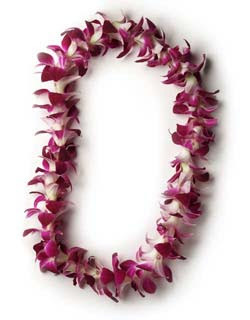 Wouldn't you want to get lei'd too? Yeah, I thought so! Ooo you will have so much fun!!! If you are back before the 23rd and want to get together w/some of the Chicago bloggers from BlogHer, email me! We are having brunch on the 23rd.